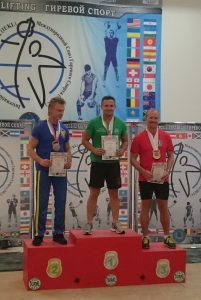 I still can’t believe it but on Monday, the 13th of July, 2015, I (Cian Foley) won the 78-85kg (bodyweight) Amateur European Kettlebell Championships in Golden Sands in the Long Cycle (Clean and Jerk) event, Varna District, Bulgaria YAY! I managed to score 76 reps but had 5 no counts so I’m quite pleased with the performance as it was hot and sticky on the day. You can see my grip failing (on the right in the video below) at the end because the bells handles were like a bar of soap due to the heat and humidity. I’ve trained very hard over the past few months at Peak Fitness under the instruction of Rosaleen Flynn and luckily I had enough in the bag to dig it out in the end and finish in first place. I won the Amateur Mens Long Cycle event in the 78-85kg bodyweight division beating stiff competition from Sweden and Norway. In this event, we Clean and Jerk 2x24kg (approx. 7 stone and 8lbs between them) kettlebells as many times as possible in 10 minutes. It’s very demanding on the cardiovascular system and gets progressively tougher as the time goes on, eventually utilising the anaerobic system for the final sprint (if you have anything left at that point). If you’re interested in having a go at Kettlebell sport and you’re from Waterford look up Waterford Kettlebell Club at Peak Fitness (if you’re not from Waterford there are loads of clubs around Ireland affiliated to the AIKLF). Kettlebell sport has changed my life transforming me from being very unfit and overweight (18 stone) to being at a very high level of fitness and 13 stone in about 3 years, and European Champion to boot. YIPEE!!! 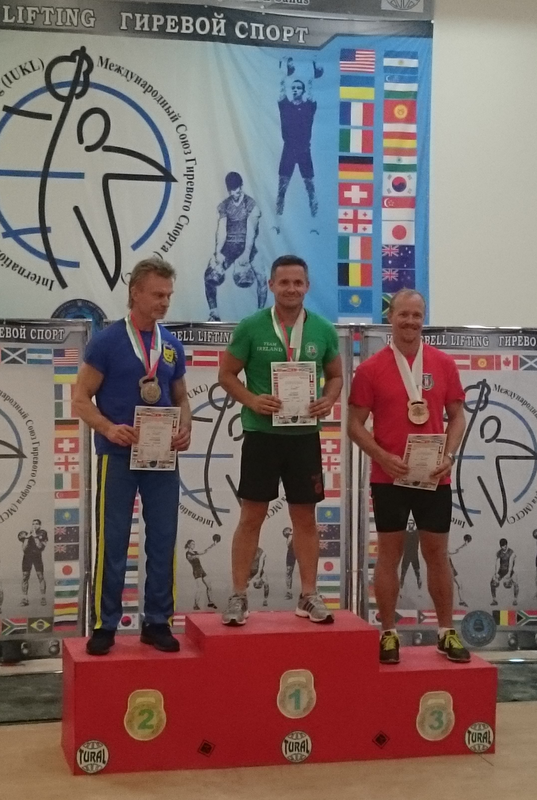 This entry was posted in Kettlebell Sport on July 16, 2015 by Cian Foley.